In these challenging times for both public libraries and grass roots singer-songwriters, the answer may lie in closer collaboration. Although the sound level barrier will need to be torn down, the longer you think about it, the greater the synergy reveals itself in the multi-facetted world of the written word. This association was taken to its literal conclusion as a venue was sought for Josh Harty’s return to the Birmingham area. So step in Thimblemill Library, a community focussed organisation located in an art deco building and steeped in adopting an innovative approach to securing alternative streams of funding. 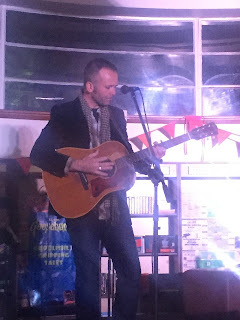 The result was a partially surreal but wholly captivating night of acoustic music decorated by a backdrop of the science, religion and crime fiction sections. While a modest cover charge may have contributed to a healthy turnout, it is still a feat to attract folks on a Saturday night with all the inside and counter attractions of an urban environment on the Sandwell-Birmingham border. This was especially fitting considering that all three acts on the bill were by nature going to play a host of unfamiliar songs. True singer-songwriters rarely stray from the opportunity to expose the gifts of their own literary talents, whatever the turnout and situation. Of course CDs are on sale to convert the unfamiliar into the familiar and thus ensure the work of the recording singer-songwriter is rewarded and the creative process is financially re-fuelled. Opening performer Dan Hartland did comment on the gratitude artists have for people taking a chance on music they have previously not heard. While more ardent live music devotees thrive on this opportunity to discover, it can be a tough ask for others. Thimblemill Library did live up to its pre-requisite by presenting the ideal listening environment allowing both Dan and fellow support artist Mellow Peaches the prime platform for sharing their songs, music and stories. It helps that both are regular players on the West Midlands acoustic music circuit, albeit Dan returns to his hometown from a wider geographical base, previously Cheltenham and now Stafford. The evening was billed as an Americana line up with Josh Harty all the way from North Dakota perhaps the neater fit of the three performers. Dan Hartland is more on the contemporary folk side of the acoustic spectrum matching his heartfelt songs with engaging stories and recollections. 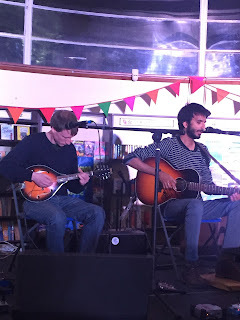 Mellow Peaches was organically presented as a duo on the evening cultivating an instrument based country blues sound merging the twang of finger picked guitar and mandolin. Periodically they became a trio with the addition of a guest percussionist on an intriguing washboard contraption complete with mini-cymbals. Their original songs were joined by an instrumental piece and a rendition of the popular gospel Americana anthem ‘Will the Circle be Unbroken’. 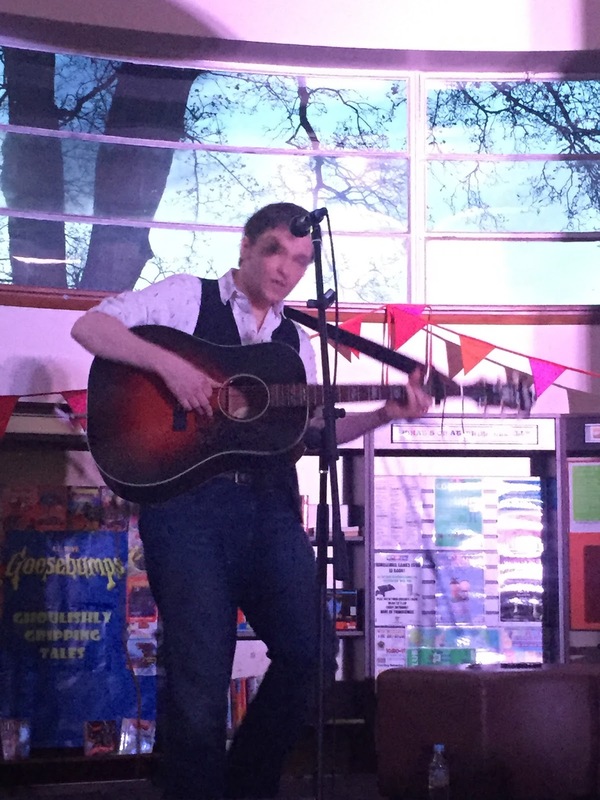 It was almost twelve months to the day since Josh Harty was last in the area when his 2015 UK tour with Kelley McRae called into the Kitchen Garden Café for a show. This time Josh was the sole representative from North America and the proud owner of a brand new record to add to his back catalogue. Among the tracks from HOLDING ON shared with the audience were ‘Wired’ and ‘English Rain’, coupled with an enlightening set of tales ranging from growing up in a small town in North Dakota to the perils of being a travelling musician touring a foreign land thousands of miles from home. Josh played the archetypical troubadour role to a tee and maximised every minute of his hour on stage. In line with the song writing theme of the evening, much of the content would have been totally fresh to a majority of the audience, with the exception of an encore version of Buddy Holly’s ‘It Doesn’t Matter Anymore’. It was certainly a case of the contrasting worlds of words colliding in a setting which seemed fitting to the art which was on offer from the assembled stage. Survival for aspects of our literary culture is often reliant on instinct and the message from this evening is that innovation can work with respect to where you take music. Sometimes below the radar music has to work a little harder even to the extent of penetrating urban communities and exploring what’s in our very own vicinity.